The 2019 Grand National is almost here! To celebrate the most anticipated race of the year, many online bookies have already started offering incredible deals and free bets for punters. We collected here the best offers on the market at the moment! Profit before these unmissable promotions will be taken away! 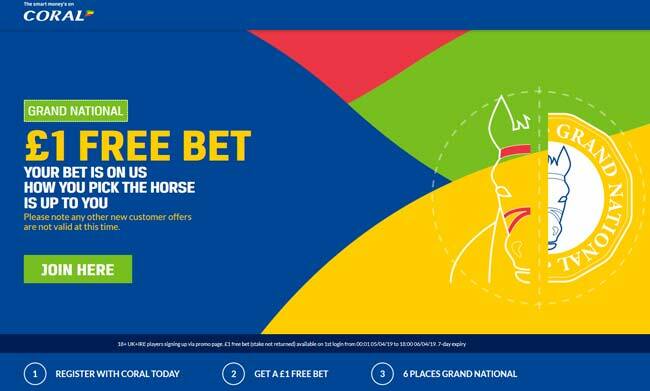 With most of the online bookmakers removing their regular welcome offer ahead of the Grand National, we have partnered up with many of the top online betting sites to provide our readers with special free bets. It's estimated that a quarter of the UK adult population will bet on this year's renewal, so we don't want let you down! New customers only. Minimum £10/€10 win or each way on The Grand National. Free bet from 9am Sun 7th April 2019. (4 day expiry) Free bet, currency and payment method restrictions apply. Full terms apply. New UK customers only. Deposit and place a £10 bet with minimum odds of 4/5 (1.8) on any sporting event and we'll give you a £10 Free Bet. £10 Free Bet. New UK customers only. You must opt-in to the £10 Free Bet promotion upon registration. Minimum £10 deposit and qualifying bet required at minimum odds of 4/5 (1.8) in any sportsbook market, within 14 days of opening account. Min deposit of £10 required. You will receive your £10 Free Bet Token within 24 hours of your qualifying bet being accepted. There are many betting firms out there who don't leave punters high and dry on Grand National day. Not only do they offer various promotional deals but they are paying out enhanced each-way places on the big race. It’s a great news for all racing punters! 18+ UK+IRE. Available Online & Mobile. Each-way bets paid at 1/4 place odds. Standard place terms apply if 19 or fewer horses run. Rulr 4 may apply. T&cs apply. Available on Betfred.com and Betfred.mobi E/W bets paid to 6 places at 1/5 place odds. Applies to ‘Winner or E/W’ market only. Full T&Cs Apply. New customers offer. First deposit must be £10. You will receive a £10 bonus. Place a series of bets at minimum odds of 1.6 with a minimum stake equal to the combined value of 2x your deposit amount and bonus funds received and once such bets have settled, any bonus funds and winnings remaining will become withdrawal. 30 days to meet the turnover requirements. 18+|Gamble Aware. 1/5 the odds for E/W bets. Applies to Online, Mobile, Phone, Text & Retail bet. T&Cs apply. 18+. GambleAware. As with every major horse racing event, online bookmakers will deliver a great variety of Grand National betting free bets and Grand National betting offers. If you are looking for the best Grand National promotions you can find them all here at BetAndSkill. This is the reason why we have also put together a list below of the best specials and racing promotions to use if you’re thinking of having a punt on the Grand National 2019. 18+. UK+IRE only. Min first bet £10 a odds 1/2 or more. Tote and Pool excluded. Must be placed within 14 days of account reg. £30 credited as 3 x £10 free bets. Not valid with CashOut. Free bet valid for 4 days. Free bet stake not returned. T&Cs apply. Get 2 Horses for the price of 1! New customer offer, place a single Sportsbook bet up to £/€ 10 on the Aintree Festival (April 12th,13th,14th) and get a free bet matching your stake (up to £/€10). Deposits using credit/debit cards or Paypal only. Valid for 30 days. Free bet stakes not returned with winnings. T&Cs apply. 18+. UK/IRE customers only. Max refund £/€20. Win or win part of e/w outright singles only. Min field size required. 1st bet on each race. Free bet expires after 7 days. Free/void/antepost bets don’t qualify. Gambleaware.co.uk. T&Cs apply. New customers only – Minimum deposit of £10 using deposit code 30fb - A qualifying bet is a ‘real money’ stake of at least £10 placed on any sports market - Minimum odds of 1/2 (1.5) - Free bets credited upon qualifying bet settlement and expire after 7 days - Free bet stakes not included in returns -Deposit method and withdrawal restrictions apply - full T&C’s apply. "Grand National Free Bets, Betting Promotions & Money Back Offers"